Background: Prior to starting Vidsy, Keeley studied entrepreneurship and travelled the world, while Campbell freelanced as a DP for clients such as the BBC and Channel 4. Morris has a background in events, having set up an events company as a student. 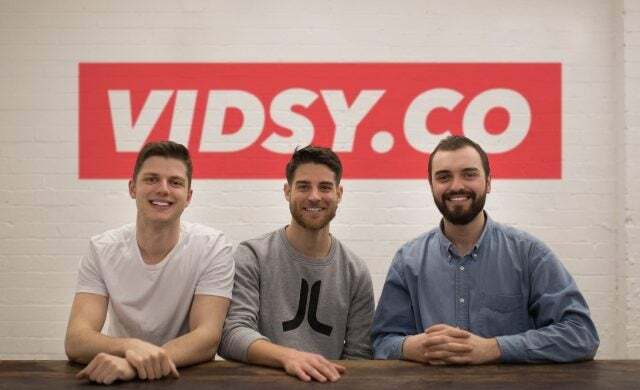 Vidsy helps brands create original and authentic mobile video ads. With our tech platform and creator network we provide a fast and hassle-free video production solution to create high impact mobile video ads at scale. Mobile has changed the way we watch content but TV’s infrastructure to produce video remains the same. This means brands, looking for video ads for social, are often trapped in a slow, time consuming and expensive production process, designed decades ago with TV in mind. Vidsy’s built a new video production model with everyone in mind. We use technology to simplify campaigns at all stages from briefing, to production and insights. Basically, brands can use Vidsy to get rid of boring admin and spend more time creating videos. At the same time, our technology also connects brands with a talented and diverse creator community, who collaborate with brands to produce banks of mobile friendly original video. We’re disrupting an industry that needs to change, allowing more creativity to come from existing sources. There’s just so many people able to challenge standard TVC ads with their mobile content. We also wanted to show that, as an agency, you don’t need a Cannes Lion before you can work with Fortune 500 companies. What were you doing before you started Vidsy? We all have links to advertising, but not one of us has a direct background in the industry; this is why we have such a fresh perspective on the industry. Gerard Keeley: I’m originally from Australia. I studied entrepreneurship and founded a start-up that ended up failing. I then travelled the world for a year. Arriving in London penniless, I was hungry to grow a business from nothing. Archie Campbell: I was freelancing as a DP on a number of shoots for BBC, Channel 4 and a number of music videos. I came to a turning point though when I went back to visit my old university and found people more talented than me were struggling to find work. I was just amazed that there was so much untapped creative potential and that there needed to be a platform where they could make money from their ideas. Alex Morris: Whilst at university, I helped to set up a student events company. This helped me see the power that companies like Facebook had in building communities, and thought someone needed to do the same for mobile video. Once we had the idea for Vidsy, we managed to persuade big brands to let us create for them. We then realised that we had to shoot all of this content, so we enlisted all our creative friends. It then grew naturally from there, with more big brands as well as creators signing up use our platform. Start-ups live to break the rules. We just enjoy creating a business that’ll cause a big change in the industry. We’re excited to be in London, we want to bring in experts of their fields, expanding our own talent pool. People are also motivated by our communal office space, it doesn’t feel like a standard office. Everyone enjoys being around people, it’s just a very flat structure at the company. We’ve even recently hired someone who’s moved all the way from Scotland to work for us! The best thing is that everyone’s excited to grow something, take on an exciting challenge and be at the future of where mobile video is taking the world. Gerard Keeley, CEO & co-founder of Vidsy, will be appearing at The Festival of Marketing, 4-5 October, Tobacco Dock, London.